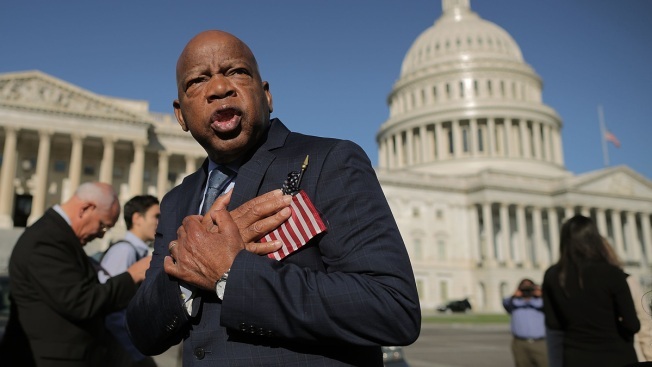 In this Oct. 4, 2017, file photo, Rep. John Lewis (D-GA) thanks anti-gun violence supporters following a rally with fellow Democrats on the East Front steps of the U.S. House of Representatives in Washington, DC. Civil rights icon and U.S. Rep. John Lewis was hospitalized Saturday night for undisclosed reasons. Lewis' spokeswoman Brenda Jones told The Associated Press on Sunday evening that the 78-year-old Georgia congressman had been released from the hospital. All tests were completed and the doctors gave him "a clean bill of health." She says Lewis thanks everyone "who shared their thoughts, prayers and concerns during his stay." She did not release Lewis' condition or elaborate on when exactly he was admitted to the hospital.